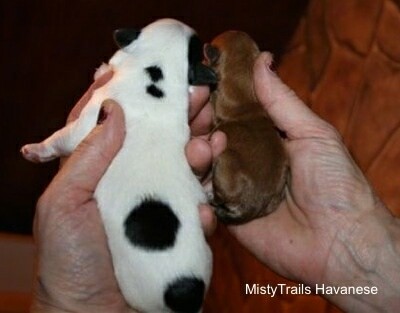 Both are four-day-old puppies from the same litter; one is a preemie and one is not. 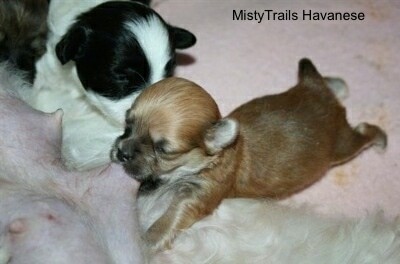 It is thought that one puppy in a litter can be conceived later than the others. In a normal mating all eggs drop together and they all ripen at once. Eggs are hormonally influenced to ovulate. Science tells us that once the hormone reaches a certain level the eggs are released and whatever sperm is swimming in the dam will fertilize the eggs. 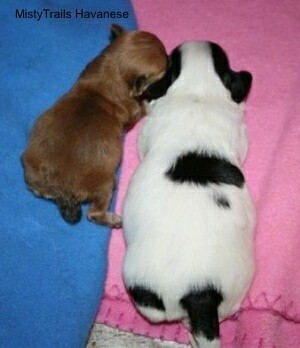 This is why if more than one male has bred the dog in the last few days there can be multiple fathers. But somehow, sometimes, some think an egg will either ripen later, or another egg will drop. What exactly happens is unclear and there are many different beliefs, but every so often in a litter, there is an underdeveloped, smaller puppy conceived. 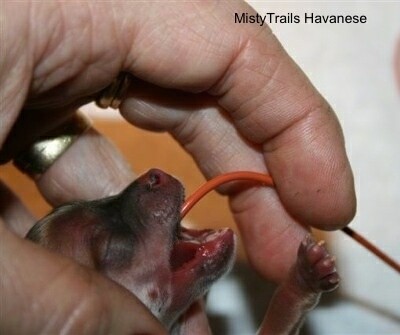 These puppies rarely live, and cannot survive without human help. Modern science and studies show that this puppy was not preemie, but just small for gestational age (SGA), and it is fact that the eggs were all fertilized at the same time. 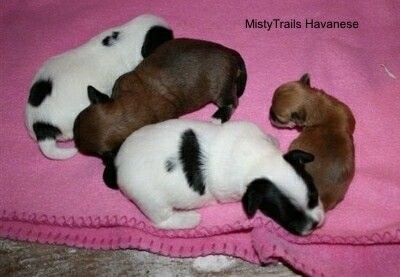 These puppies are often called runts. 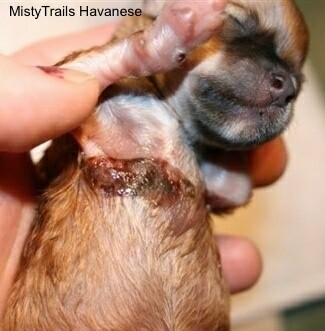 Some puppies just have a poor foundation and need to be able to be brought along until they get their footing. They are underdeveloped because of a poor implant site in the uterus. They could have been on an old placenta scar or on an area that just didn't have as rich a blood supply. Sometimes the egg lands in a spot of tissue that is too thin, or doesn't have a strong vascular system underneath it to guarantee good blood supply to the fetus. There is nothing his owner did wrong, and nothing that could have been done to prevent it. The better an implant site is the bigger the puppy will grow. 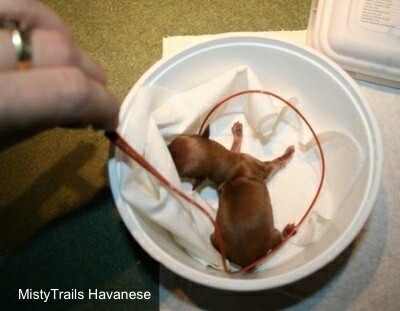 A malnourished puppy in the womb will be premature in development when born. In either case however the care is the same. 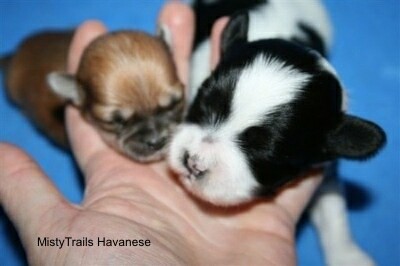 They are underdeveloped and a fraction of the size of their littermates. They are small because of their placement in the uterus, but still need ALL the steps that are mentioned below to help them catch up in strength because they have been poorly nourished in the womb. 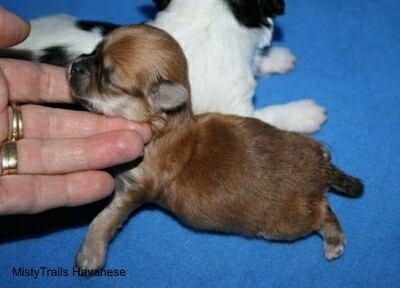 For this article I am going to refer to the pup as a preemie as his development is definitely premature. 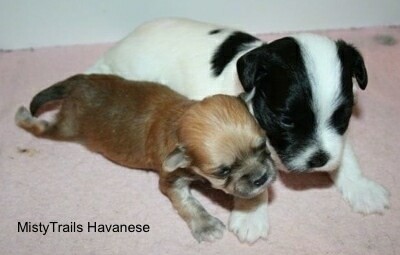 Preemie puppies often reach full size by adulthood, but SGA puppies start off tiny and stay tiny. Time will tell what the case may be for this puppy. Just like a preemie human baby they need extra warmth and help feeding, often tube feeding is necessary and sometimes SubQ hydrating. If you do not have a tube or know how to feed, just try to use an eye dropper till you can get one. HEAT is VERY important, as they are meant to still be inside the dam, which is 100° F.
A preemie needs to eat every two hours. By a week old it should be every 2.5 hours, and by two weeks old you can feed him every three hours. Going an extra hour at nighttime is usually okay. 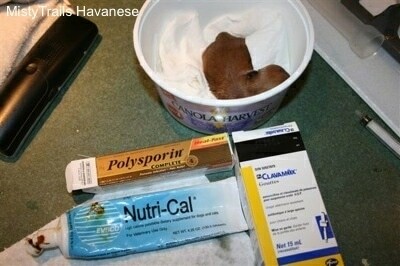 A 50 g puppy needs about 1 cc every 2 hours. 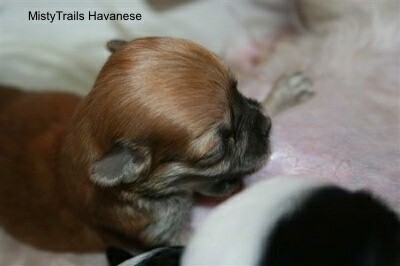 A 100 g pup needs about 2 cc every 2 hours. And this amount increases by .5 to 1 cc per day, every 2 hours. 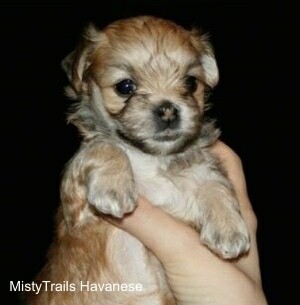 A preemie puppy rarely lives depending how early it is. You have to remember dogs are only pregnant for 59 to 63 days, therefore every day counts. 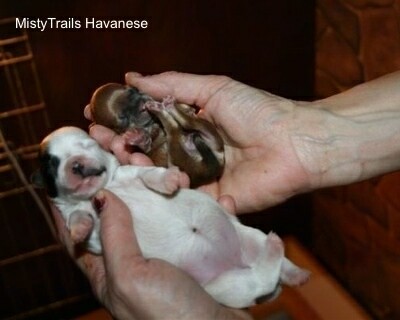 Puppies are whelped 63 days after ovulation, not after breeding. A very large litter or a singleton pup can throw this off a day or two. Illness in the mother can also result in premature birth. 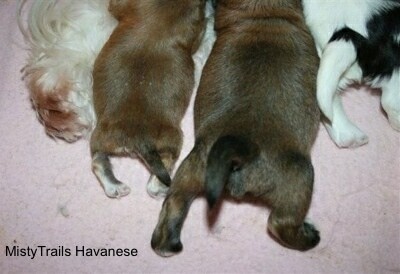 If your puppies are born 59 days after a tie it means the dam ovulated four days prior to your breeding her. Eggs generally take three to four days to ripen. 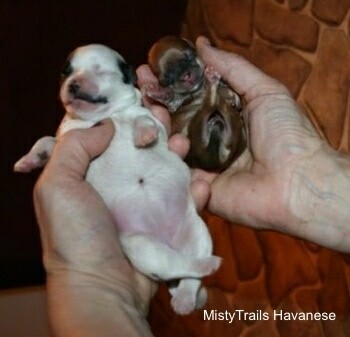 It is apparently proven by a vet that a canine can have twins; one placenta, 2 puppies = identical twins. 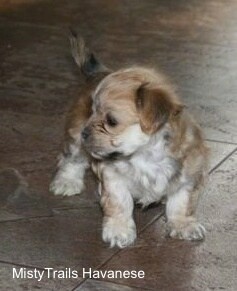 This little brown puppy's name is Bandit. 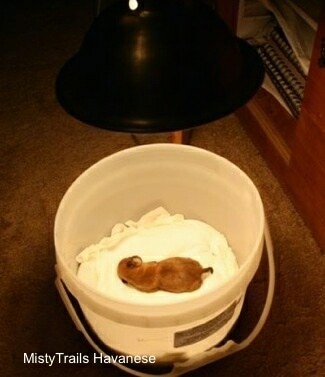 The following is a day-by-day diary of trying to save this puppy. Day 6 102 g. Doing GREAT! Day 7 118 g. Was doing great, but in the afternoon suddenly bloated up and went very weak. Constant crying and gasping. Day 8 126 g. Seems stable, but weak, and still bloated. 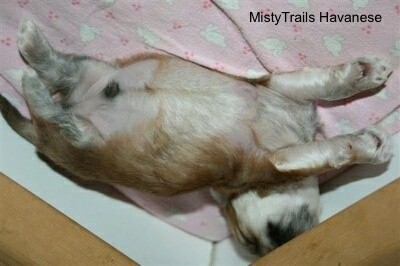 This syndrome is often seen in full-term puppies and referred to as fading puppy syndrome by many. Bandit is doing much better than last night, in that he is not suffering; he is comfy and content, but weak. His chances at survival are guessed at 50%. I have heard from many breeders who say at a week or two they just lose a puppy; the tummy swells up, it gets weak and it fade away, and they do not know why. Firstly I had to get him warm, not just a little warm, but warm to the core and having him in my bra wasn't enough. I made an incubator with heat coming from below and heat coming from above. I put rice pads in it and a warm water IV bottle for him to lie on in order to simulate littermates. He cannot digest food if he is cold and he was cooling down even though I had the whelping box quite warm as I normally would. That worked for a week, but he needed it even warmer; for some reason, maybe an internal infection, he wasn't holding body heat. And I wasn't able to get any food in him as the prior feeding was still sitting there after a couple hours. The heat was like magic to comfort him. Then I gave his tummy a break by Sub Q feeding for two feedings, putting 3 cc of Lactate Ringer’s water in the skin of his neck. I emptied his bowels and made sure all was working with a warm enema. Started him on Clavomox (antibiotic), giving .01 cc every 4 hours. Now an unknown sore has developed. I don't think it is a wound. It was spreading and it is thickening the skin and oozing. Very strange. 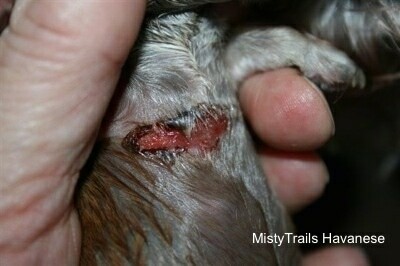 I am putting Polysporin on it and will have the vet look at it tomorrow. He is being fed every two to three hours with a little less than I usually give. I am adding a Nutri-Cal dab to each feeding along with .5 cc of water. His poop is green, but his plumbing is working. I am trying to keep the wound dry. I put Polysporin on it, and he lies on his back. I think the heat lamp will help it. He is holding up his head, he has the strength to lift his head off the blanket, which he has not been able to do for 24 hours. 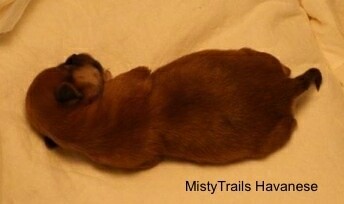 Day 9 weight is 122 g., and went up to 128 g.
Bandit the preemie puppy had a good day today. He went to the vet, but they couldn't tell me anything. He is still bloated, but not weak anymore. He is strong enough to try nursing. The last two tries he got 2 cc. This time, however, he got 6 cc. I think he MAY be on the upward road. He is crawling again too. I still have not found out what the bloating is and his belly is still very bloated. 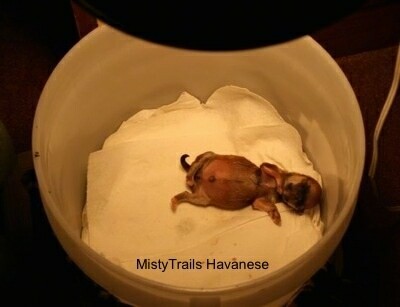 I have asked all over and many breeders have had this happen and lost a puppy at a week old, but no one knows what it is. The vet confirmed that his heart is good. He has spent a lot of time with his mom and litter today. His mom Catreeya licked his scab off. I think this is good. Still not sure what the sore is from’ perhaps from being born early and having thin skin? Separating him from mom so I could keep ointment on it helped. I also put a paper absorbent inside the open wound to help dry it. The heat lamp also helped dry it. Day 10: Weight – 130 g.
Day 11: Weight – 136 g.
Day 12: Weight – 146 g.
When I helped the breeder with the litter that produced a water baby or walrus baby, the vet had NO idea what it was, but I found out by going to a pediatrician. I decided to do the same thing for this preemie puppy—to ask a human baby doctor for advice. I found out about necrotizing enterocolitis (NEC), which happens in premature babies typically within the first two weeks after they are born and milk feeding has begun. It basically means their stomachs, like Bandit’s tummy, are not developed enough to digest food yet. Preemies have immature bowels. They are prone to infection and are sensitive to changes in blood flow. They often have problems with oxygen, blood circulation and digestion. This often increases the chances of developing NEC. Preemie babies are not offered food, but fed through IV for a while introducing food slowly. Too much food is too much of a load on them. Introducing food can cause bacteria to enter the gut wall and can even burst through. Preemies do not always show a temperature drop, but still get a gut infection. The exact cause of NEC is unknown. However it is possible that the intestinal tissues are too weak and with the lack of oxygen and/or blood flow, they cannot handle the stress of food going into the stomach and intestines. Bacteria normally found in the intestine invade and damage the wall of the intestinal tissues. The doctor suggested to cut back on the food, and do not feed every two to three hours, but feed half as much and do subQ fluids for the other feeding times, in order to take the load off the stomach. I did not cut back much. I cut back from every two hours to every two and a half to three hours and cut back the puppy formula, trying to feed as much dam’s milk as possible. Little Preemie has taken a good turn for the better. 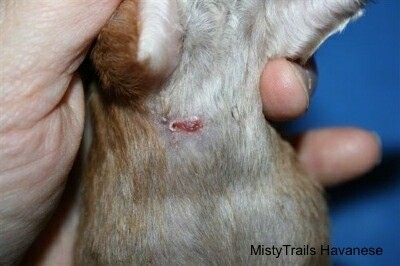 The wound is drying up and he is very, very squirmy when I have to hold him for mom to potty him. His strength is back. His tummy is still swollen, but a little less. The last three feedings have been 8 cc, 8 cc and 10 cc, which is awesome. I can only tube 4 to 6 cc into him if I feed him by hand. 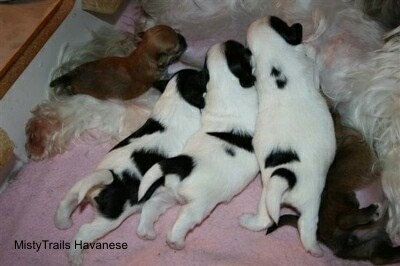 At feeding time the larger pups find the teats and drink three times faster than the preemie. 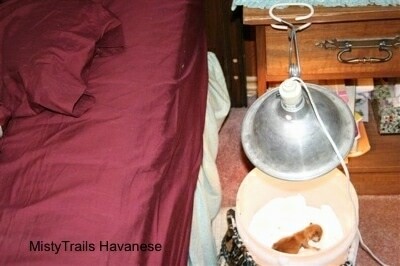 When a pup drains one teat, it moves to another, pushing the preemie away. If I want the preemie to get any natural breast milk, I have to intervene. To ensure the preemie gets some milk I have the mom crated in between feedings. For example, if I witness a feeding with letdown at 9 a.m. and I see all puppies get a good feeding, I tube feed the preemie and then at 10 a.m., I crate the dam, knowing that the next feeding is at 11 a.m. I can then let the mom out of the crate, which I have placed in a spot where she can see her puppies. I supervise and use my hand as a barricade, so the preemie can have a teat and drain it without getting pushed off. I leave the dam with all the puppies to tend to them from 11:00 a.m. until noon. At noon I crate her, to prepare for the 1 p.m. feeding. If I do not do this, I may walk in at 12:50 p.m. and find that she has fed the puppies and the preemie hasn't eaten. This method is time consuming, but when a puppy does not do well on formula, or goat’s milk, the dam’s milk is the best and should be used whenever possible. Little Chance (new name, changed from Bandit), or Lazarus (pending name) has healed well and very quickly. He has been gaining weight steadily for the last couple days. The cut on his underside has mended quite nicely. He is nursing from his mother at feeding time. At this stage I must still intervene. I am feeding every four hours at night. I usually have to tube feed him for the first morning feeding, because he hasn't eaten any milk during the night and is hungry. His littermates do not let him eat very much, if at all, when I am not there to help him. 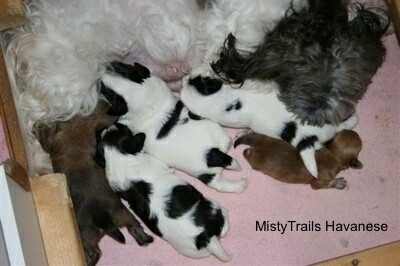 I let him have the back two teats, holding the other four puppies on the front four teats. A minute after let down I have to put my hand in to create a barricade so he does not get pushed off. 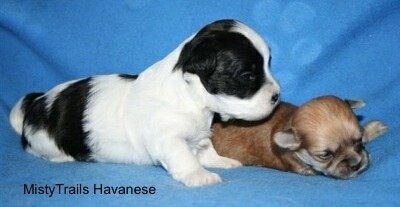 Picture of him with his sister; still very small compared to his littermates. His bloat has gone down, but not completely. He still has a swollen belly and I will keep him on antibiotics for a while, but he is looking healthy. Day 8: 127 g., Day 9: 122 g., Day 10: 130 g., Day 11: 136 g., Day 12: 146 g., Day 13: 162g.—2 weeks=186 g., gain=98 grams *GAINED 24 g. yesterday…YIPPEE* Day 15: 190 g., Day 16: 202 g., Day 17: 234 g., Day 18: 240 g., Day 19: 254 g., Day 20: 278 g.
2 weeks = 186 g., gain = 98 grams *GAINED 24 g.
9 weeks = 1730 g.
Preemie puppy at two weeks old and his brother. 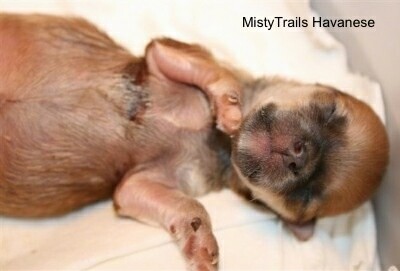 Preemie puppy at two and a half weeks old—little preemie eyes are starting to open. He is about four days behind the others. He is sucking well, but if I don't get up to feed him, or I go out, he gets nothing. He is taking a bottle good. 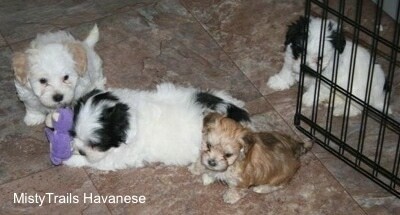 Preemie puppy and littermates at three weeks old, nursing. 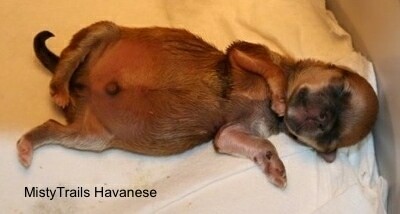 At three and a half weeks the preemie pup is doing very well. 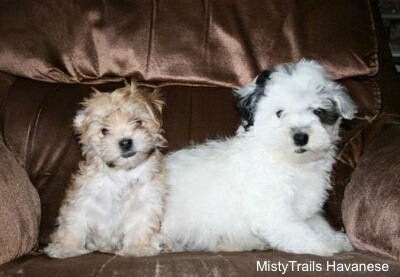 Preemie puppy and his littermate at 12 weeks old—the vet has given him a 100% healthy checkup twice. 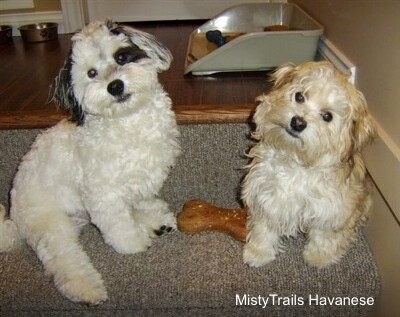 Preemie puppy and his littermate at six months; these two are absolutely wonderful together. The black-and-white guy is a normal size and preemie is the smaller one. He is thriving.